Although Kansas offers a wealth of great cycling, when you consider the opportunities available in other states in the region, the possibilities are practically endless. Our neighbors have numerous bike rides and events, a large number of trails, and a wide variety of scenic and varied geography to experience. Arkansas is "The Natural State", and that is certainly reflected in it's cycling culture, which leans heavily toward the mountain biking side of the sport. The northwestern part of Arkansas is home to the Ozark and Boston Mountains, the western part of the state shares the Ouachita Mountains with Oklahoma, and southeastern Arkansas is dominated by the delta flatlands Mississippi River. Arkansas also offers some wonderfully scenic roads and boasts a number of low-traffic routes perfect for cycling. If mountains are your idea of heaven, then you can't do better than Colorado. The state is defined by the majestic Rocky Mountains, and boasts a vibrant cycling culture for both on-road and off-road enthusiasts. The state attract cyclists from all over the world who want to challenge themselves on epic rides such as the Bicycle Tour of Colorado and Ride The Rockies. Colorado is also home to bicycle-friendly communities such as Boulder, Denver, Fort Collins, and Longmont. In the cycling world, Iowa is most famous for RAGBRAI, the annual bicycle tour across the state. It is the longest, largest and oldest such event in the world, and each year attracts over ten thousand cyclists from all over the nation and the world. Iowa also has a strong cycling community, as well as an extensive network of trails and rural roads to help you discover the state's natural areas and friendly people. 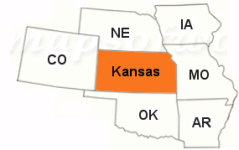 The Show-Me State has a large and active cycling community, with numerous clubs and shops, particularly in Kansas City, Springfield, and St. Louis, as well as incollege towns such as Columbia and Rolla. The annual "Tour of Missouri" road race brings professional cycling to the mid-west, and the Katy Trail brings in tourists from all over the world. The state has numerous opportunites for mountain bikers as well, particularly in the rugged Ozark mountains. The Sooner State offers some of the nation's most diverse terrain, everything from Rocky Mountain foothills to cypress swamps, tallgrass prairies to hardwood forests to pine-covered mountains. The state also features a rich history and culture, a friendly atmosphere, and western charm in abundance. Both road and mountain biking are popular activities in Oklahoma, and there are numerous trails, races, and organized rides to keep you busy.